No, a honeycomb chocolate bar does not mean that there is bee-made honeycomb in it. Honeycomb, if you're like me a few years ago and haven't heard of it yet, is a sugary and crumbly, toffee-like candy. The air holes mimic the spaces in a honeycomb, as the sweet taste mimics the taste of honey. But the Honeycomb bar from Chuao Chocolatier does in fact use honey, instead of simply mimicking it. I've had a few Chuao bars before, but it usually isn't a brand I feel particularly drawn toward. Maybe it's the name. Maybe it's the packaging. Maybe it's even the flavors. Yet despite this almost-apathy, I have general good thoughts toward Chuao. I was looking at a Vosges bar before I saw this one, then thought, oh, I'll get the Chuao bar, Chuao is better than Vosges, right? Maybe. But I am rambling. I find myself interested in one of the little logos on the back of the wrapper (no card box for this $4 bar, though most bars over $2 have one). It proclaims that this is "ethically sourced cacao." You see, I would often find myself explaining to people that a chocolate bar need not necessarily have a Fair Trade stamp in order to be fair trade/ethical. The Fair Trade system isn't perfect, and often chocolatiers who really care about the quality of their cocoa and work with the cacao farmers are going to be seeing that everyone is getting their due, even if they don't get their chocolate bars marked out with all the fancy labels. So I find it interesting that Chuao has included this separate label to let consumers know that they're paying attention to the ethical side. As you can see, this is a beautiful bar of chocolate. 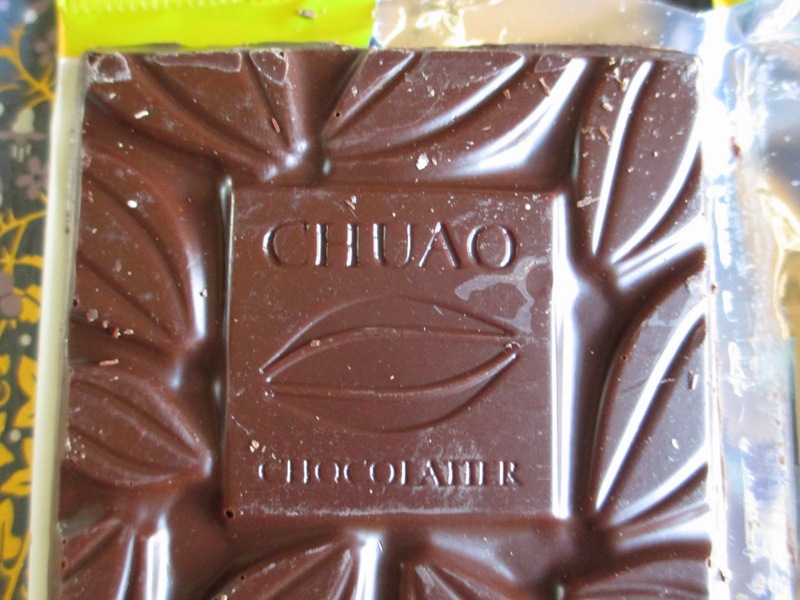 It's a solid rectangle molded with the images of cacao beans and Chuao's label on top. The closest design I can think of was the setting of cacao vines on the old Starbucks chocolate bars. On the back of the bar, the finish is bumpy from all the little bits of honeycomb. These are set all around the chocolate and have a light yellow, honey color. The chocolate, which is 60% cocoa, is darker and less red than it appears in the pictures. It has a similar, marshmallow-like aroma to the Trader Joe's Dark Chocolate Lover's Bar, just in a much lighter version. I would tend to picture honey more with milk chocolate than with dark, sort of like in a Toblerone bar. But then that's why this is a fairly light dark chocolate at 60%. It doesn't have any bitterness to it, but it also isn't boring because it is accented by all that honeycomb. And what, as I have hinted, makes this honeycomb chocolate bar better than the one or two others I've had is that the honeycomb does contain honey and therefore does taste somewhat of honey. It's a light enough taste that you aren't overwhelmed by richness, yet the richness (paired with the dark, instead of milk chocolate) plays as much part as does the sweetness. So Chuao has taken the idea of honey chocolate and brought it away from the candy aisle and into the chocolate arena. It's a sweet dark chocolate, but a sophisticated approach to sweetness. It's very pleasant.